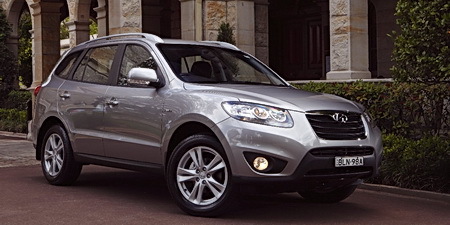 The Santa Fe is a 4-door, 5-passenger sport-utility, available in 8 trims, ranging from the GLS 2.4 Manual FWD to the Limited 3.5 Auto AWD. The automatic control of gear shifting vibrates and drags aftewr running about 10,000 km. We refer this to the hyundai commonwealth service and found that the problem is caused by defective electronic board,they promised to replace the part but its been more than a month now and still no replacement. Of course even with assurance that this is not dangerous we opted to avoid using the vehicle. The present cumulative odometer reading by now is only about 10200km. Very sad experience from hyundai. The vehicle is very comfortable to use but with the defect that came out from very low mileage and poor after sale service it is not a good brand to choose if you have limited car for the family. very quickly. In our case every two weeks. Interior seats were all cleaned and treated with a protecting sealant and discoloured re-occurred in two weeks. is where this black dirt substance appears . Was told that it is due to the light beige colour of the leatherette seats, the material used, the colour of clothing worned and the in and out of the car. For a family SUV, this is excellent value for money. I really like the engine which is 270 HP. It is quite responsive on the overtake and accelaration is impressive. Fuel consumption is average for its class. There are plenty of features such as the reverse camera and the ful set of airbags. the 7 seat configuration is really useful for people carrying but there is barely any luggage space then. However, fold the rear seats down flat and you get plenty of luggage space with a flat floor to boot. On the down side, the buttons on the steering wheel are not in the right place for thumb use. You have to change your hand position to use them which defeats the purpose of those buttons in the first place. When you open the doors, the is a flimsy cheap feel to the locking mechanism. The seats are a bit on the firm side. Needed time to get used to them. have had it back to dealer several times and have been told its vibrates about the same as others. In the shop 3 times and it still vibrates. All the resolves they suggest costs us money but doesn ot fix problem.It semms they want your money for not fiing the problem that should be covered on warrenty. I purchased the vehicle in June 2007 and now (October 2010)have 43,000 miles on it. Still drives like new and I like having all the comforts of the Limited model. I feel like I got a good value for the money. I had to replace bulb in one of the rear tail lights and because it was difficult and it required a special type of screwdriver I had to take it to the dealer to replace. Was not happy about having to pay $12 to just replace a light bulb as I am used to doing those things myself for a fraction of the cost. I think what I have enjoyed the most about having the vehicle is the low cost of ownership. Besides the cost of regular maintenance of changing the oil every 3,000 miles and recently getting new tires I have only had to get the light bulb replaced as mentioned above. During this year the vehicle also started to hiccup at startup one moring and I took it to the dealership who told me it needed an update on the engine computer and there was no charge for that. They did it while I waited and the car has been running like new. I also have to add that the dealership has been a pleasure to deal with. Before this vehicle I owned Toyotas and thus have come to expect very little major issues with my cars. I am especially grateful for the good performance so far from my Santa Fe since my other half has an Audi A4 that is a total money pit. The Audi has 50,000 miles and oil is leaking again. Issues started just before 30,000 miles on the Audi and so far the break cable was locked causing the rear lights not to go off and thus draining a battery which was replaced, the radiator leaked, after that was fixed the oil started leaking and its doing it again after just a few months. Oh and the drivers electric window system had to be replaced. So yes I am pleased with my Santa Fe. looks good inside and out.buttons are in right places.price was good.warranty great ride on smooth roads. ride isnt the smoothest living in buffalo.bought front wheel drive wondering if should of got AWD version. if your roads are as smooth as glass this is good choice. 2005 Santa Fe - traded in for 2007 for third row seating. is where this black dirt substance appears. If it occurred 2 or 3 times a year it would be understandable but EVERY TWO WEEKS - ! Could the dirt come from within the seat? Hyundai Canada informed us that the seats are defective and nothing can be done. My wife is the primary driver and she uses the vehicle mainly to go to and from work. Using warm water and a mild soap cleans the surface of the seat. We purchased the car for 5 years therefore will have to clean the seat approx. 120 times. If there is a problem with the light beige leatherette seats may be the consumer should be forwarned of it. Hyundai Canada should re-test their leatherette light beige seats or at least have a representative actually come and see our seat problem. The black substance which appears on the seat has never been defenitely identified. Can't fit rear facing car seat in back, tire pressure monitoring system always fails, defrost turns on during startup, airbag won't sense 115 pound wife. This car has been a horrible vehicle. Purchased for the safety of an SUV and got it home and found out the wife doesn't even make the airbag sense her. One would think a car made in Korea would have a sensor for smaller weighted people! Tried to put a rear facing car seat behind the driver (I'm only 5'6") had to pull the driver seat fully vertical and forward to fit it. Completely unsat for a vehicle supposedly built for this. TPMS light has stayed on virtually constantly, sick and tired of being told to put air in the tires or it's the temperature changes. I live in Vegas not much change in hot! This car was a horrible purchase and I wouldn't recommend it to anyone. Trading it in for a new ride after only a year. Goodbye money and POS car!